An abandoned building, killer fried chicken and a porch swing are three elements Antonio Swad used to create Mesquite’s newest hotspot. Swad founded both Wingstop and Pizza Patron but went in a new direction when he opened Porch Swing on Feb. 18. Unlike his other restaurants, Porch Swing boasts a local restaurant aesthetic. 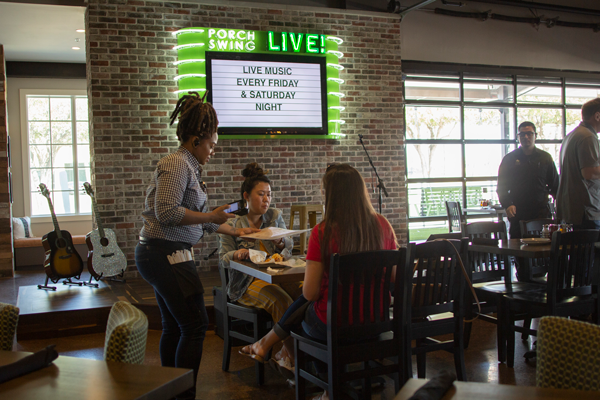 Located near I-635 and I-30 in the old Spaghetti Warehouse location, which sat empty for nine years, Swad hopes Porch Swing will attract patrons from surrounding Rockwall, Sunnyvale, Forney and Richardson. The interior is completely different from that which housed the Spaghetti Warehouse. The combination of warm Edison lights and cultured woodwork walls are complemented by black and white framed photos. An eye line of exposed brick ties in the vast fireplace on the patio, which is visible through the transparent garage doors, and the affectionate seating spaces placed throughout. “The only thing that stayed the same is the address,” Swad said. Swad worked with Mark Risser and MJ Moreau from Studio B Design to reimagine the space. This creative trio delivered a sleek, simple, inviting environment in a nearly farmhouse space with touches of modern detail at every turn. Swad said he has a passion for hospitality and creating an environment that enhances a person’s life enjoyment as well as providing comforting and high-quality food. 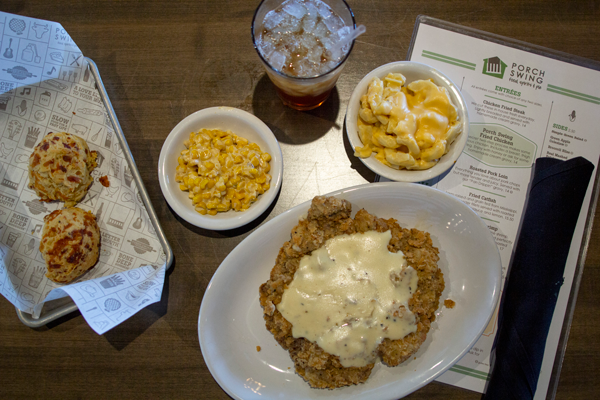 The modest but balanced menu is comprised of eight entrees: two chicken, two beef, two pork and two fish. The team cuts their own meat and prepares all 55 items needed for their dishes in house. Porch Swing also boasts fruit, nut, cream and seasonal scratch pies. Pies become their own genus of food, not just a dessert, with these no-extract, fresh ingredient options. Swad worked with chef Andy Revella to develop dishes that are familiar by name yet bold in flavor. Swad said his food would find an audience that will appreciate the time and money it takes to source ingredients, develop recipes and present well-rounded dishes. At any given time, pop music can be heard over the flatware from the kitchen. Swad’s favorite thing about this space is the vibe on Friday nights, around 8 p.m., when the lighting is just right, his audience is seated with their meals and a band is taking the stage. Quality of sound was top priority when selecting the 32,000-watt and 32 channel board that evenly distributes sound from the restaurant to the porch. The modest stage is set up for a 10-minute plug-and-play experience for the musicians and personal interaction with the audience. Ryan Berg and the Velvet Ears from East Dallas have already graced the stage, and John Tipton and Corey Breedlove are lined up for future performances. Swad’s dream booking is John Mayer because of his underrated guitar skills. Swad spent two years focusing all his energy into this project and finding the perfect location.